We have a professional’s pool of talented experts that help us to create the best array of Stylish Makeup Pocket Mirror. They are available at the lowest rates. We are leading manufacture all kind of handicrafts item. The item made by mud with glass work & nice finish on it. 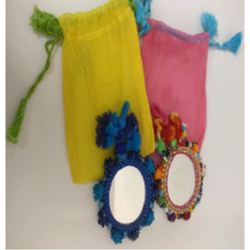 We are engaged in offering supreme quality range of Fabric Pocket Mirror to our clients. This Fabric Pocket Mirror is designed by our expert professionals as per the norms set by industries. These products are tested on different quality parameter before dispatching to the market. The Folding Pocket compact mirror is used for portable carrying in purse, ready to use anywhere. This awesome foldable designer mirror is really a great piece of merch. Beads and thread work on the surface and when you open, check out the two mirrors on each side to check your beautiful self out in! We are the market leaders in manufacturing elegant and tasteful Ladies Pocket Mirrors. Our Pocket Mirror is available in extensive range of designs with customers having the option to choose from a wide variety in shape, size and color. These mirrors can easily be carried in the purse and pockets of an individual. The mirror can be designed to custom suit the individual client.